There was a time in the not so distant past when the food served onboard most cruise ships – carbohydrate-laden buffets, rubbery pizzas, and greasy burgers and fries – added greatly to the passengers’ gross tonnage by cruise’s end. My boyfriend and I just spent the past week aboard Silversea’s newest luxury ship, Silver Spirit, sailing from Barcelona to Lisbon while sampling cruise cuisine’s much more refined and appetizing present. And while we did gain a few pounds, it was a result of dining on what is, hands down, the best food we’ve ever tasted at sea. The Restaurant: The main dining venue is the go-to spot for dinner menus that change nightly but also feature classics such as Caesar salad and grilled salmon. The highlight is a trio of “La Collection du Monde” dishes created in partnership with Relais & Chateaux chefs, which included fresh crab spring rolls and braised veal breast with spicy honey sauce. 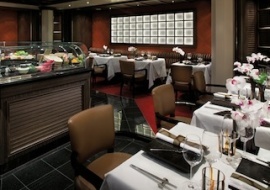 Each evening a complimentary white and red wine selection – most quite delicious – is offered based on the menu. La Terrazza: This indoor-outdoor breakfast and lunch buffet spot turns into a reservation-required Italian eatery come nightfall. The menu stays the same throughout the seven-day voyage, but includes some standouts such as fettuccine with duck ragout and fresh grilled swordfish, paired with Italian whites and reds. Le Champagne: For a modest $30 per person fee, couples can experience a six-course degustation menu by master chef Jacques Thorel of L’Auberge Bretonne (plus select a bottle of wine from the Connoisseurs Menu at an additional cost) in this seductive, 24-seat Relais & Chateaux Wine Restaurant. For a splurge of $200 per person, each course will be paired with world-renowned vintages selected to complement the flavors. The menu changes nightly and on our voyage ranged from A Discovery of Caviar to “A” for Asparagus to Bordeaux Rendez-vous (our choice, with dishes that included a “passion” of coffee and foie gras, baby artichokes stuffed with duck ragout and perigord truffles, and herb-roasted filet of lamb). Seishin: Silver Spirit’s other extra-charge eatery is this 24-seat Asian-Fusion restaurant offering a French-style degustation format, for a $40 fee that includes wine and beer. Prepare to relish the flavors of the sea, from artful sushi and fresh sashimi to savory mussels and sweet sea bass – with a wagu beef course to satisfy carnivores. Stars Supper Club: An innovative menu served from 9:00 pm to 11:00 pm and accompanied by live jazz music is a fabulous option for couples that prefer to dine on the later side. The Grill: An alfresco poolside lunch spot morphs into the fun and casual “Hot Rocks” Grill after dark, where you cook your own steak, chicken, or seafood on sizzling rocks set on your table. Evening Under the Stars: The pool deck is the setting for this barbecue extravaganza that dazzles with an array of cold salads and every grilled protein imaginable – from jumbo shrimp and suckling pig to smoked ham and filet of beef. 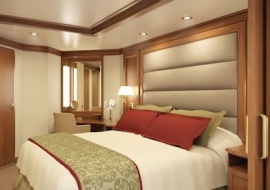 The Suite Life: A full 95 percent of Silver Spirit’s suites have outdoor space, ranging from 376-square-foot Veranda Suites to 742-square-foot Silver Suites to the top three suite categories, Royal, Grand, and Owner’s, with square footage from 990 to 1,528. And with one of the highest space to guest ratios at sea, there’s plenty of room to accommodate full bellies – and a well-equipped Fitness Center to burn off extra calories. 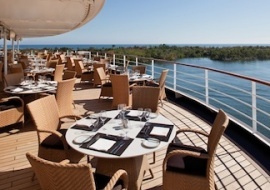 Silver Spirit sails the Caribbean from early November 2010 to early January 2011 and then begins a World Cruise, returning to the Mediterranean in late May 2011. Seven-night, all-inclusive (except where noted) cruise fares start at $3,078 per person.